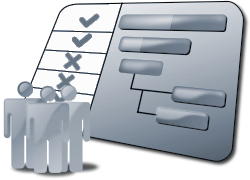 The Dolibarr task manager allows you to report to Dolibarr team development, any new feature or enhancement you would like to see by default into standard distribution of software. For information about Roadmap, see the Roadmap developer wiki page. Dolibarr ERP/CRM is a software package built by modules addition (you enable only features you need), to manage small or medium companies, freelancers or foundations. We can say Dolibarr is an ERP or CRM (or both depending on activated modules). DoliWamp, an auto-exe installer for Windows users. DoliMamp, an auto installer for Mac OS X users. DoliBuntu, an auto installer for Linux Ubuntu/Debian users. For other OS, you must manually install the "standard version" and all its prerequisites. Works with Mysql 3.1 or higher, experimental support for PostgreSql.